WP Engine vs Bluehost: which provider truly has the best managed WordPress hosting services? Bluehost and WP Engine are both leading WordPress hosting providers on the market, but it’s time to choose the real champion. 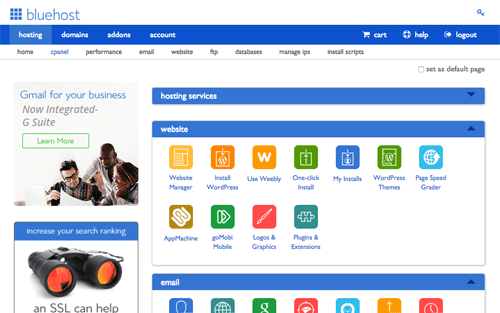 While WP Engine is a WordPress-centric managed hosting solution, Bluehost provides you with a wide variety of hosting options, including managed WordPress hosting. In our unbiased WordPress hosting comparison between Bluehost and WP Engine, we’ll explain how they differ from each other. We’ll also help you decide which one is the best solution for your needs. Bluehost is one of the most popular web hosting providers on the market. It’s also an officially recommended WordPress hosting service by WordPress.org. 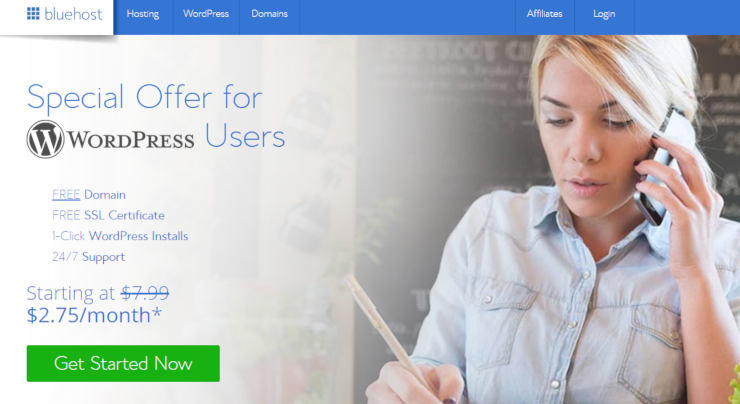 Bluehost offers a wide variety of WordPress-centric hosting plans, such as shared WordPress hosting, managed WordPress hosting, and WooCommerce hosting. On top of WordPress-centric options, they also provide shared, VPS, and dedicated hosting services. WP Engine, on the other hand, is focused solely on providing managed WordPress hosting solutions. Whether you’re starting a blog or running an enterprise-level business with off-the-chart growth, you’ll find the right hosting solution to meet your needs. Speed is one of the most critical factors you need to consider when choosing WordPress hosting. Even a 1-second delay can result in a 7% reduction in conversions. Not to mention, if you don’t take website loading speed seriously, you’ll be leaving a lot of money on the table. To analyze the speed and uptime of the hosting servers for our WP Engine vs. Bluehost comparison, we created a test site on both hosting servers by signing up for their shared hosting plans. Pingdom test to monitor the loading times and availability. Load Impact test to analyze the performance of the servers during peak load times. Bitcatcha test to determine how the servers would perform in 8 different geographical locations by ignoring the content. According to our Pingdom test, our Bluehost test site took 689ms when tested from New York City, which is faster than 94% of tested sites. Whereas our WP Engine test site only took 582ms to load, which means the site’s faster than 96% of tested sites. It’s also important to analyze if the hosting server can survive a traffic surge. For our traffic surge test, we used a tool called Load Impact. We sent some virtual users to our sites and gradually built up to 100 visitors at a time to see how the servers performed. From our test, it’s evident that the number of live visitors doesn’t have any negative impact on either Bluehost or WP Engine servers. According to our Bitcatcha test, our Bluehost server responded in less than a second throughout the globe. The overall performance was graded C by BitCatcha, whereas WP Engine was graded A by BitCatcha. Bluehost constantly revamps their onboarding experience to ensure anyone can easily launch a website without prior experience. They offer a free domain name, free SSL, 1-click WordPress installs, and everything else you need to get your site up and running. Conversely, WP Engine is focused on high-traffic websites and enterprise-level businesses. They handle all the technicalities of optimizing your server for improved performance. You get a fine-tuned hosting setup that’s built specifically to operate WordPress sites. They don’t allow you to install any plugins for boosting your site speed, like CDN or caching plugins. While you can run a WordPress website on WP Engine without having to worry about optimization and WordPress security, the reality is that it’s not the right solution for everyone. Additionally, there’s a bit of learning curve to tackle if you host your site on WP Engine. Bluehost hosting is primarily geared towards beginner-level users, so you can expect all beginner-level features to start a blog or website, including unmetered bandwidth, SSD storage, free SSL, 1-click installers, etc. With a slightly more expensive plan, you’ll get unlimited email accounts, unlimited SSD storage, site backups, $200 worth of marketing offers, etc. Being a managed WordPress hosting solution, WP Engine promises high availability, powered by Amazon Web Services and Google Cloud Platform. Their hosting plans come with a wide variety of built-in tools to help you build, test, and migrate your site. With every hosting plan, you’ll get premium access to 35+ StudioPress themes for free. On top of that, you’ll also have 1-click tools to set up development, staging, and production environments. Bluehost provides 24/7 support via live chat and phone. In an effort to focus on providing direct support via live chat and phone, they’ve discontinued email-based support. The downside is that if you’re just too busy and can’t wait for an agent to respond via live chat, you won’t be able to get your support query solved. This can also be frustrating to users who want to solve advanced issues that may take a bit longer to resolve. With their starter plan, WP Engine only offers 24/7 chat support. Phone support is only available with their more expensive plans, starting at $115 per month. The regular pricing for Bluehost shared web hosting starts at $7.99 per month. The cost of starting a new website (which includes the domain name and web hosting cost) can be expensive if you’re just starting out. That’s why we’ve negotiated a deal with Bluehost to offer our users 65% off web hosting. With Bluehost, you only have to pay $2.75 per month. Besides a huge discount, you’ll get a free domain name and a free SSL certificate when you purchase a web hosting plan from Bluehost. 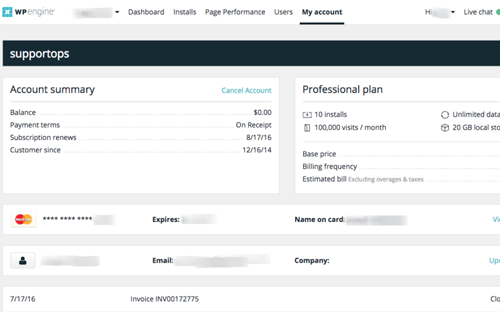 The regular pricing for WP Engine starts at $35 per month. If you want a monthly subscription, then you can get a 30% discount on WP Engine, so you’ll just need to pay $24.50 per month. For beginners, Bluehost is the best choice as it comes with a wide variety of WordPress hosting plans. When starting out, you can choose their WordPress hosting plan, which costs just $2.75 per month. They also offer a managed WordPress hosting service, which starts at $19.95 per month. WP Engine, on the other hand, is one of the best managed WordPress hosting solutions available on the market. If you don’t want to optimize your WordPress hosting on your own, then you might want to consider WP Engine for hosting your site. If you like our comparison, we strongly recommend reading our full Bluehost review as well as our complete WP Engine review.